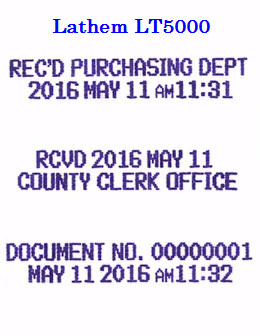 Two Line Quiet Stamp for court houses, dispatch desks, and more. Nearly silent operation. Programmable print. User programmable two line stamp, just insert the card or document, it prints in under two seconds, and prints TWO lines! This quiet automatic date time stamping machine can be SHARED by offices. With mechanical stamps, you need separate brass plates for each department. 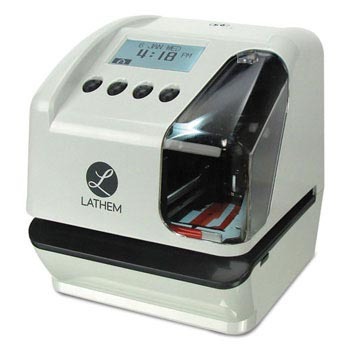 Because the LT5000 is user-programmable, you can easily change what it prints! It also comes with four buttons. Each button saves a print file. Press a button, it prints what you want. Store up to 4 messages or departments. Desk, cabinet, or wall mount. Comes with rubber feet.